Two hundred and fifty miles of gruelling tarmac and dirt track, hot, scorching sun, across torturous desert and mountain. 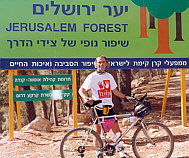 Such was the prospect awaiting us as we prepared to take part in the 1999 Holy Land Cycle Tour. The Tour organized by Classic Tours aimed to raise money for Help International. I was commissioned to photograph the tour and I also had the opportunity to get involved with the cycling. Help International is a Christian Third World relief and development agency providing health and education projects in several African nations as well as India, Pakistan and Sri Lanka. The primary aim of Help International is to promote health, care and development for all people regardless of race, colour or creed. In particular, they are currently raising funds for food, clothing and educational needs of many people, to provide and supply health clinics in Livingstone and Sachibondu, Zambia, to encourage income-generating enterprises with practical support in very poor communities, and to support the provision of a primary school in Livingstone. Classic Tours is a company with lots of experience of organizing cycling expeditions. Since 1992 Classic Tours have worked with a number of major charities organizing sponsored activity events. The organization by Classic Tours was second to none, providing us with bikes, mechanics, a Doctor and guides, with each day's routes very efficiently planned. During our cycling, we would be accompanied by three support vehicles, a lead car to warn traffic ahead of us of our presence and to carry all our water, food and medical supplies, a truck for carrying cycles and spares, and a coach for carrying all our baggage and for anybody who felt that they could not go on any further. We were provided with 24 gear mountain bikes with the gears arranged in three groups of eight, while a team of Israeli mechanics ensured that they were always well maintained and set up according to our every whim. Also we would be accompanied by three experienced couriers who were prepared to lead the fastest and middle groups, and also hang behind to provide encouragement and help to the slowest. The cycling was not meant to be a race and everybody was free to go at their own paces without worrying about holding anybody up. Spectacular views of mountains and deserts and mountains not to mention wildlife such as hoopoes, kingfishers and bee eaters around the fertile Galilee sections and Ibex and wolves occasionally through the deserts helped considerably to alleviate the endurance element. Accommodation along the way was provided by a mixture of hotels and Israeli communes called kibbutzes. Our first day after flying from Heathrow to Tel Aviv was spent familiarizing ourselves with the cycles provided for us at a kibbutz on the shores of the Sea of Galilee at En-Gev. The Sea of Galilee also known as the Sea of Tiberias, Ginossar or Kinneret, is 21km long by 11 km wide and is an area rich in exotic bird life and also affords good views of the nearby Golan Heights that until 1967 were under Syrian control. As they were so close, it was a good opportunity to visit some Biblical landmarks such as Capernaum, which according to Matthew was Christ's own town, the Mount of Beatitudes where Jesus gave the Sermon on the Mount and now marked by an octagonal church at its summit, and we also visited one of the places on the River Jordan where Jesus is believed to have been baptized. The next day was the start of the expedition as we woke to a day initially overcast with a welcoming cool breeze. Our first day of cycling was to take us about 31 km from En-Gev to Bet-She'an for lunch before another 14 km ride to Kefar-Ruppin, our kibbutz for the night. The route covering a mixture of road and dirt-track, was an undulating route taking us alongside the border with Jordan for about 8km. Fortunately, Israel is currently in a state of peace which was shown quite well by the friendliness of one of the border patrols we encountered. The border is marked by a long stretch of barbed fencing separated by a strip of gravel which one is not permitted to cross, something one of our party inadvertently did. The guards though were very laid back and did not cause any fuss, quite a contrast to fairly recent times in Israel's turbulent past where such ignorance would probably be rewarded by a bullet in the back. Our route around the region of the Israeli/Jordanian border was mainly dirt track but nothing particularly bad. Soon afterwards the main highway stretched out before us like a grey band. Traffic on these stretches is quite well spread out and there is usually quite a wide hard shoulder to cycle on, making cycling in Israel very safe. Soon we experienced our first really big hills and with the now searing midday heat, this began to get quite strenuous, but with several drinks stops, it wasn't unbearable and soon we were into Bet-She'an for lunch and a swim in the nearby natural hot springs. Taking things gently, we had taken about 7 hours. The final 14 km was then mainly downhill to our kibbutz at Kefar Ruppin. Day two was our hardest ride covering a hefty 87km. The temperature was very hot as we set off from Kefar Ruppin 6 km along a badly rutted dirt track to join the main highway. Rain in the night had caused the route to become pretty muddy necessitating quite rigourous cleaning of our machines by our mechanics to make sure our brakes in particular were in a safe condition to proceed, before we were off on the road again for a long 53 km run. The highway was quite smooth making cycling up and down hills fairly easy until once more the midday sun was above us sapping energy as we entered the desert region. At this point we were running alongside the once war torn West Bank border with Jordan, giving us clear views across into the lush fields of Jordan. The arid desert of the Israeli side now seemed so serene and apart from the ruins of one or two abandoned settlements, there was little to betray the turbulent history of this once war-torn region. Carrying on we left Israeli territory for Palestinian, the road signs and street advertisements now appearing in Arabic text rather than Hebrew. Eventually, we arrived at Pezae'l for lunch where we could also relax watching the crocodiles in the local crocodile farm. Suitably refreshed, we now needed to cover another 21 km, but the breathtaking views of the Jordan Valley helped considerably to lift spirits until we reached Jericho where we could do a bit more sightseeing. Jericho itself is today a small town of only 7000 people but ancient Jericho is a site of great historical importance being most famous for the fall of its walls following the blowing of ram's horn trumpets by the priests of Joshua and the first city conquered by the Israelites after the Exodus. However, Jericho has been destroyed many times in its history, new cities being subsequently built on top of the previous ruins forming a tell or artificial hill formed from archaeological debris. By digging downwards, it is possible to study each city as a layer, and it was possible for us to peer down one such excavation to see a wall dating from the 13th century BC. After leaving Jericho, another 7 km brought us to the kibbutz at Almog where we were to stay overnight. Day three was again very hot and sunny, however in the deserts in Israel this heat is a very dry heat and when cycling one is cooled by a nice gentle breeze. The need for regular stops for copious water though is always at the forefront of our minds as it is so easy to lapse causing fatigue and cramp through dehydration later on. Cycling began in a fairly relaxed way, being on nice easy public highway occasionally passing Ibex bounding across the narrow ledges of the steep hillsides on our right, and it was not long before we had our first views of the Dead Sea as we left the Palestinian territory behind. a very fast, very steep downhill section followed by a difficult low gear uphill led us past an oasis of date palms to Ein Gedi by the Dead Sea giving us a well earned opportunity to relax, floating in the sea. The Dead Sea is the lowest point on Earth being 400m below sea level and as such has an extremely high salinity meaning that nothing can live in its water except some extreme examples of halophytic bacteria. Its salinity also means that buoyancy in the water is greatly increased so that it is possible to just sit back in the water without sinking. As such, any visit to this region is very much a must-do activity. Refreshed from our dip, the next section was a nice comparatively easy 20 km from Ein Gedi to Masada. The desert region around here is prone to flash floods and it was surprising to find big puddles in one part, though splashing through these did give refreshment for tired limbs. On the way we were helped by a quite strong tailwind pushing us. Consequently, none of the hills proved particularly difficult. However, about 5 km from Masada as we made a right turn to approach the town, we were suddenly hit by a killer hill that made cycling very tough. Although only 49m above sea level, it has to be remembered that we had climbed from about 200m below sea level and were now cycling into quite a strong wind. Some were able to cycle up, but personally, I found it quicker given my inexperience of hills to walk. Once at Masada, we could take a cable car to the ruins of an ancient fort on the top of a mountain , towering almost 300m above the Dead Sea where we could see virtually the entire 20 km route of our cycling from Ein Gedi stretched out across the horizon , making this a very satisfying sight. The fort, of great Jewish historical importance was built by Herod the Great and seized by Jewish rebels called the Sicarii in 66 AD during the Jewish War against Rome and preceded to Jerusalem. However, after being defeated during the fall of Jerusalem in AD 70 they were forced to return to Masada where reduced to less than 1000 men they lay siege to the Romans. Eventually, seeing that all was lost, the inhabitants decided in favour of death over slavery to the Romans and there was a mass suicide, the Romans discovering 960 bodies the next day with just two women and five children spared to tell the tale of what had happened. From Masada, a few more km brought the days cycling to an end at the modern city of Arad. Established in 1961, it was built on a natural elevation near the Dead Sea, to ensure a mild climate and was built to house health and tourism resorts, whilst 8 km west is the ancient mound of Tel Arad showing a history of human habitation going back 5000 years. Day 4 saw us leave Arad early to try and avoid the major traffic, and this was to prove a very difficult day with heat exhaustion a common factor, a couple of the party collapsing through sheer exhaustion resulting from dehydration in the scorching conditions and having to spend the rest of the day in the support bus. Leaving Arad, the first stage of the day's cycling was a 32 km off road section taking us close to Lahav, occasionally passing the odd Bedouin settlements near the edge of the road. The road itself was quite gentle in its undulations until a 5 km off road section to our lunch stop at Shomria. After lunch we experienced some more arduous cycling off-road to Amazya. Vibrations rattled our wrists as we bounced up and down often steep, punishing hills for about 20 km, clouds of stones and debris in our wake. By now, the hills seemed to be getting steeper as we were nearing Jerusalem, and we were now leaving the desert behind, lush vegetation and forests replacing the arid scrub and dust-blown rock. Eventually we were at the kibbutz at Galon, much to the relief of everyone, although by this time we were all a lot better accustomed to endurance riding. Our final day involved a tortuous climb beginning at Netiv haLamed-He about 13 km up a very steep graded mountain road. Again this was one that it was best to walk up although some of the more experienced did struggle to the top in their lowest gears. eventually at the top and following a well earned drinks stop, there was a glorious 7 km downhill section that was very steep. After the struggles of climbing for so long uphill, it was time for me to just let myself go, grit my teeth and hurtle, brakeless at possibly 50 mph or more, winding effortless round the smooth curves of the mountain, the wind gusting past my face, until another set of steep hills broken up by some downhill bits again before a short off-road section across rocky dirt track, the outskirts of Jerusalem edging ever nearer. Soon we were into Jerusalem itself and into the full onslaught of the heavy traffic that clogs the streets of the capital. Going through Jerusalem, we all grouped together for the big finish, and within a short time we could relax, spending a couple of days exploring the many sites of this historic city. After a time that seemed to pass so quickly, we were on our El Al flight back to England, where we could reflect and marvel at our accomplishments in completing our Holy Land adventure. For all of us , it had been an adventure that not only had been an excellent way of raising valuable funds for a good cause, but had challenged and stretched us often beyond limits that we did not know were possible for us, and yet through the dedication of the tour organizers and our own inner resilience, we had conquered and triumphed, leaving us with many lasting, memories, whilst the shared experiences had forged many close friendships that will last a lifetime. View of the Western Wall, all that remains of the Temple destroyed by the Romans, with the Islamic Dome of the Rock in the background. 148 Curtain Road, London, EC2A 3AR. The Kings Centre, 15-17 High Street, Kingswood, Bristol, BS15 4AA. Make a personal donation of £250 preferably through Gift Aid, to Help International. This covers the return flight, hotels, meals and your mountain bike and kit. You need to take out your own insurance and in addition, you need to raise a minimum of £1600 from your own fund-raising schemes and sponsorship for the work of Help International.